Smart Step™ Decalon® large entrance mat tiles alternate rows of ribbed vinyl and carpet strips to scrape and dry foot traffic in large entranceways and foyers. Featuring cut pile Decalon® carpet mat for effective moisture retention. Ribbed vinyl sections can be perforated to facilitate drainage (recommended for recessed areas only). Smart Step™ Decalon® tiles can be placed within a foyer recess depth of 3/8" to 1/2" or directly on floor — allow 9/16" door clearance. 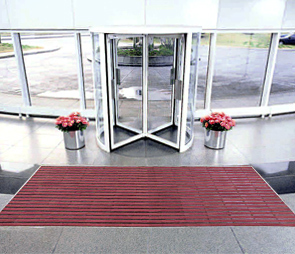 Designed to provide years of service in the busiest of foyers. Alternating rows of ribbed vinyl and carpet strips scrape and dry the foot traffic of hundreds of visitors per day. Cut-pile Decalon® carpet mat strips for effective moisture retention. Vinyl tiles made from 100% recycled PVC. Mat is fully assembled at the factory to your custom size specification. Orders must be accompanied by a sketch clearly indicating width, length and direction of traffic flow. When you measure, remember: Proper placement is for the strips to run width of mat. All mat configurations larger than 12 feet by 22 feet will be made in 2 or more sections. When ordering custom size nosing please indicate required length in inches; and number of nosings desired in the quantity box. Sold by the Lineal Foot; price is based on the sum of the total length of all nosings ordered, rounded up to the nearest foot.